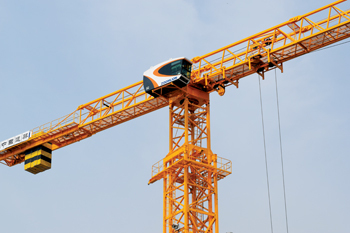 Chinese construction-machinery manufacturer Zoomlion has signed an agreement with Al Shawaf International to appoint subsidiary Al Bawani Trading Company as its sales agent for tower cranes in Saudi Arabia. The agreement was signed between Zoomlion senior president Zhang Jianguo and Mohedin Al Shawaf, executive manager at Al Shawaf International. Zoomlion hopes the agreement will allow it to further penetrate Saudi Arabia, the largest tower-crane market in the Gulf region. According to the company, while it currently enjoys a stable share in Saudi Arabia, the absence of a local sales agent has hindered its commercial growth. The agreement will allow the Zoomlion Overseas Branch Company to use Al Bawani Trading’s large spare-parts warehouses and its skills to organise sales staff and service engineers for an improvement in sales operations and aftersales in a bid to expand market presence. Zoomlion’s move in Saudi Arabia is part of the company’s initiative to spur sales in international markets after a relatively low period. The company expects to see a sharp rebound in earnings this year, following three years of profit declines. “Our 2015 net income will increase significantly from last year’s level,” chairman and CEO Zhan Chunxin told Reuters in a recent interview. Zhan attributed the recovery to its bid to diversify into other lines of equipment and deep cost-cutting. He declined to provide specific numbers due to disclosing rules. Zoomlion, which made its name selling hammerhead tower cranes and truck-mounted pumps during China’s building boom, has struggled alongside its peers from the supply glut created by Beijing’s $640-billion stimulus package launched in 2008. For Zoomlion, which warned that its 2014 earnings would slump as much as 80 per cent, a return to a healthier bottom line would be validation of its five-year effort to expand the scope of its operations. “All our efforts will pay off this year,” said Zhan. Zoomlion has added high-performance street sweepers, sewage disposal vehicles among others to its portfolio, while taking control of Chery Heavy Industry Co, a major domestic farm machinery maker. Those two business divisions, Zhan estimated, could contribute more than one-third of Zoomlion’s revenue and nearly 50 per cent of its profit this year, he said. Zoomlion, based in the Hunan provincial city Changsha, has slashed its workforce by nearly one-third, which saved at least 500 million yuan ($80.70 million). Procurement costs were also cut between 5 and 10 per cent, saving 300-500 million yuan a year. Other construction equipment makers are also reducing capacity and slashing costs. Bull-dozer maker Shantui Construction Machinery Co Ltd, walked away from a deal to take control of a subsidiary of US construction machinery firm Manitowoc Company Inc.
Zoomlion’s same-town rival Sany Heavy Industry Co Ltd cut staff by around 18 per cent in 2013, and its parent is setting up a bank in partnership with privately owned firms. Zhan remains cautious about the outlook for the domestic construction machinery market, expected to be flat this year at the best, due to continuing struggles with overcapacity.